Digital Citizenship is a huge focus for me professionally and as a student. I continuously study research on digital citizenship education. I counsel people daily on elements of digital citizenship, such as etiquette, privacy, digital rights, and keeping a healthy balance with technology. So imagine my surprise this week when my 10-year-old son gave me a lesson in digital citizenship! Last Friday, he brought home his chosen band instrument: a baritone horn. He has a great “ear” for music and was quickly able to pick out a few melodies. I captured a 30 second video of him playing and, being the proud mother that I am, I posted it on Facebook for our friends and family to enjoy along with me. End of story, right? The following Monday, he came home from school and said, “Mom, did you put that video on FACEBOOK? !” I confirmed that had, but assured him that only our friends and family could see the video, so it was perfectly safe. He said, “Mom! Don’t you know you’re supposed to ask someone’s permission before you post pictures or videos of them on the internet?!? !” He went on to say that one of his classmates (whose dad is my friend) had seen it and he was embarrassed. 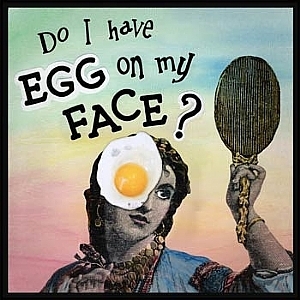 Egg on face. The thing is, I didn’t realize until that moment that my 10-year-old was a real person with real rights just like everyone else! I thought it was my decision as a parent whether to post pictures or video of him! What I learned that day was that he needs to be a part of the decision. He doesn’t fully understand digital privacy, rights, or etiquette, but there’s no way he’ll learn unless I set a good example for him and include him in the decision. I post this (with his permission!) because I think other parents may be facing a similar situation. We want our children to be respectful of others online, but we often forget to model what we want them to see. I, for one, have had my eyes opened. I will now include him, as well as my younger children, in conversations about what I post (especially about them) online and why. Through this conversation, we will hopefully all come to understand digital rights and privacy better. Have you ever had a digital citizenship lesson hit home before? Post a comment so that we can all learn from it. Thanks for reading! Image available under creative commons license from the gorgeous Flickr photostream of DailyPic. I think it’s appropriate that the first post on my new blog be about communication. As a school tech director, as a M.Ed. student, and as a parent, I spend a lot of time researching and reading about the uses of technology in education. Although I learn a lot from what I read, I need to do a better job of reflecting on and sharing what I learn. In some ways, I communicate all day long. I talk to people and answer technology questions every day. I respond in a (mostly) timely fashion to emails. I use Twitter to share resources I find with the world (and also as a way of saving them for my future self). I use Facebook and Instagram to share with friends and family. I even make an effort to use Google+ and not many people can say that! Still, I would like to do a better job communicating what I learn and I’m hoping this blog will allow me to do that. If you’re interested in technology in education, or in technology and parenting, I hope you’ll stick around.